We couldn’t have been happier to discover this ‘hidden oasis just off Rye Lane’ as Dawn, founder of The Cane Press describes it. Stumbling across this colourful shack on a scorcher of a London afternoon, couldn’t have been more refreshing. 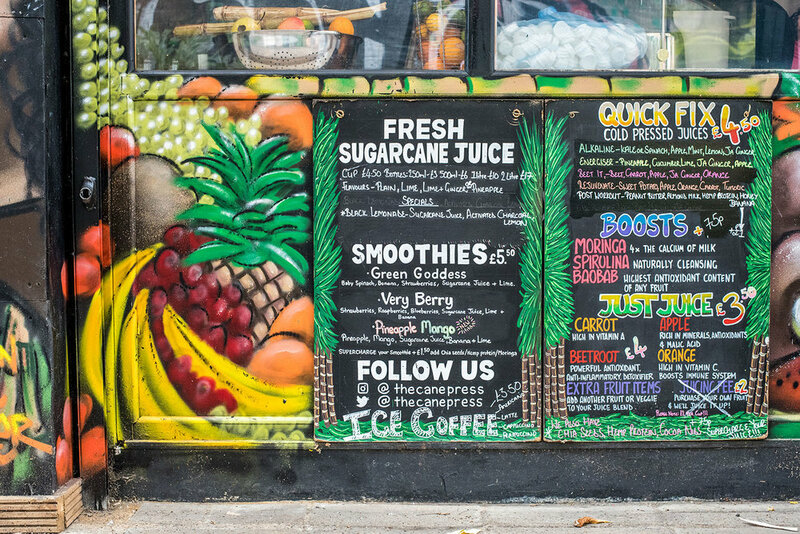 With numerous natural flavours of the champion offering, sugarcane juice (ginger and lime being our fav), fresh smoothies, juices and on colder days, porridge and grain bowls, this plant-based haven is a welcomed treat. How would you describe The Cane Press and what you offer? 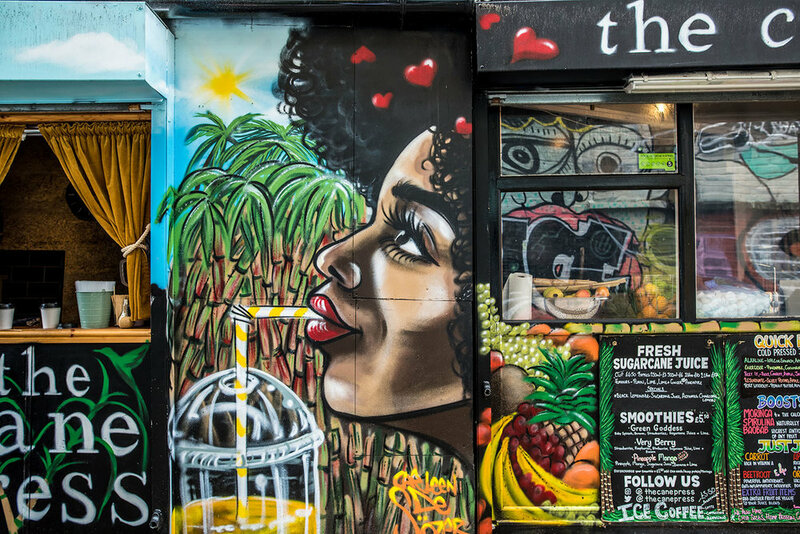 A hidden gem to escape the hustle and bustle of the high street where you can experience a true taste of the tropics. 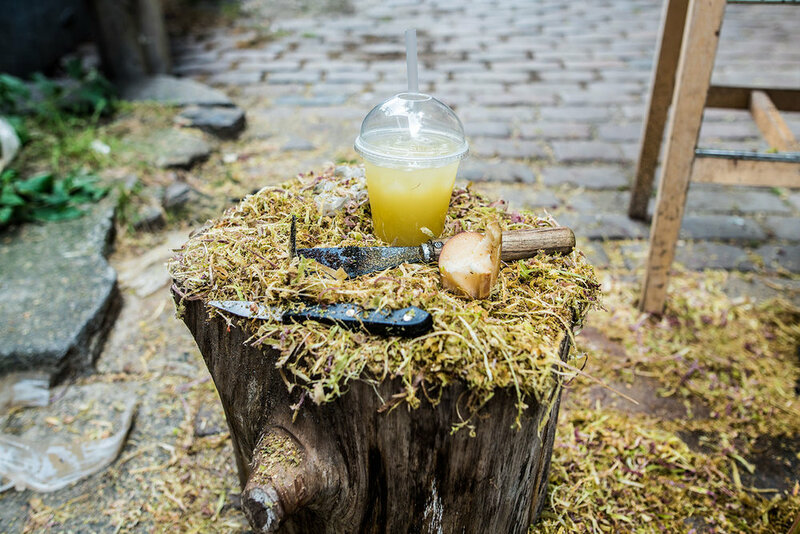 We specialise in making 100% natural freshly pressed sugarcane juice using sugarcane stalks. All our juices are 100% natural with no added sugar or preservatives. We believe in the 3 p’s of juicing. Peel, Press and Pour. Our signature flavour is sugarcane juice with lime and ginger poured over ice. Sunshine in a cup!! What was the inspiration for The Cane Press and how did it get started? Sugarcane has always featured in my childhood, relatives would often “smuggle” a couple of bags in their suitcase on their return to the UK after spending the summer in Jamaica. Sugarcane, along with frozen ackee, white rum and delicious Julie Mangoes were always top of the list of things to bring back to England. I remember spending a summer in Jamaica with my grandparents as a child and visiting the local markets. It was not an unusual sight to see a local street vendor hacking away at the sugarcane and bagging it up for the locals to purchase. We’d then meander through the market chomping on the sugarcane stalks whilst sucking out the delicious juice then discarding the pulp on the floor. 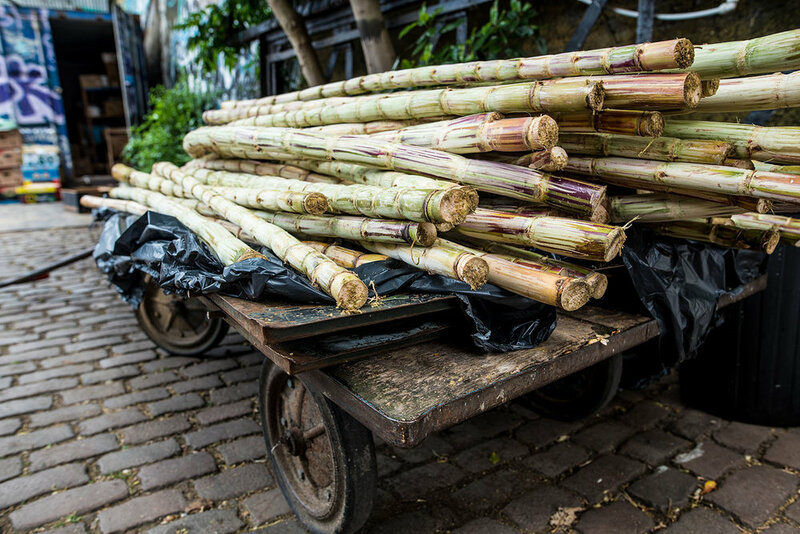 Through my continued travels as an air stewardess to other regions of the Caribbean and parts of Latin America, I noticed that not only chewing sugarcane but drinking cane juice under the sweltering tropical sun was a daily ritual among the locals. So, what made decide to bring this tropical treat to London? It wasn’t until around 4 years ago whilst trying to transition over to a plant based lifestyle I stumbled across a YouTube video on sugarcane juice. That was my lightbulb moment. I did some research and found less than a handful of people doing it here in the UK. And the rest as they say is history. Upon meeting Dawn for the first time, her honesty and passion towards the changes within the community naturally came into conversation. “The obvious changes that everyone with two eyes has noticed. The G word that we have all milked to death. Peckham by day is a different place by night. I appreciate that areas need to change and develop. The thing that annoys me the most is that gentrification so blatantly isolates a group of people that are the foundation of the community. 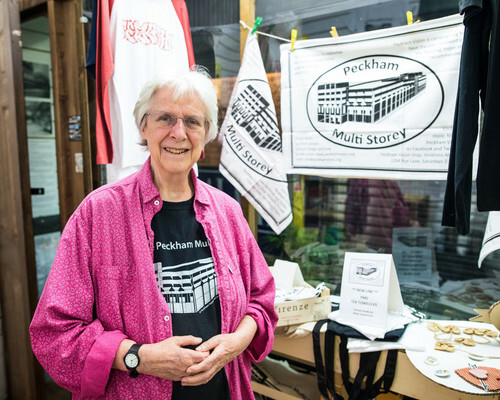 Without the African and Caribbean diaspora Peckham would not be what it is today. We talked about Peckham Levels and her awareness and hopes for the project and we can wholeheartedly say, we very much share the same outlook on its purpose and its effect on the community. When Dawn is not making people smile with her infectious positivity, she can also be found temporarily at Maltby Street Market serving Sugarcane Mojitos (speaking from experience, YUM). 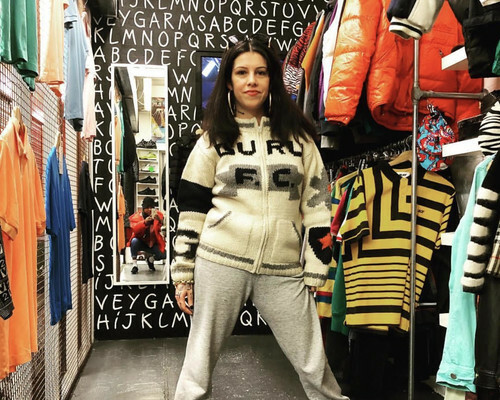 “The fact that you can now buy 100% freshly squeezed sugarcane juice just off Rye Lane....Lol....am I allowed to blow my own trumpet? No, just teasing....this is what I both love and hate about Peckham, come out of Rye station and walk 20 steps, you have a choice of Little Lagos to your left or Hipster London to your right, Gentrification at its best. You choose. Now show me another area in London where you get this amount of bang for your buck?